London is awash with the relics of Empire. Great statues and monuments commemorating great men and greater victories. But it is not always the British Empire. There is the occasional Roman Wall. And then a couple of minor road signs and a plaque, which are all that remain of the London outpost of the Hanseatic League. The League was an empire of trade which ran northern European commerce, and so much of northern Europe itself, for more than a century. Its offices stretched from Kievan Rus and Riga in the east to London in the west, with a sphere of influence that took in Greenland and Colchester. The English tend to know little of their history (relative to other occupants of these islands), and that which they do know is often somewhat heroic. Tales of kings and queens and splendid isolation. Something about being on an island, perhaps. Possibly something to do with Shakespeare: Richard this, Henry that. But also something to do with the compromises required if a “national” history is to be taught. Among the under-reported events is the Anglo-Hanseatic war of 1470-4, where the Hanse dealt such a spanking to the English navy that Edward IV was forced to Utrecht to sign a treaty which locked England out of trade in the North and Baltic seas and, essentially, ceded a chunk of prime territory in the centre of London to a foreign power. (The treaty also granted the Hanse the right to build a warehouse in King’s Lynn. It’s still there today, though now resolutely the property of Norfolk County Council). Utrecht firmed up the arrangements in London where a Kontor in one form or other had existed for centuries. 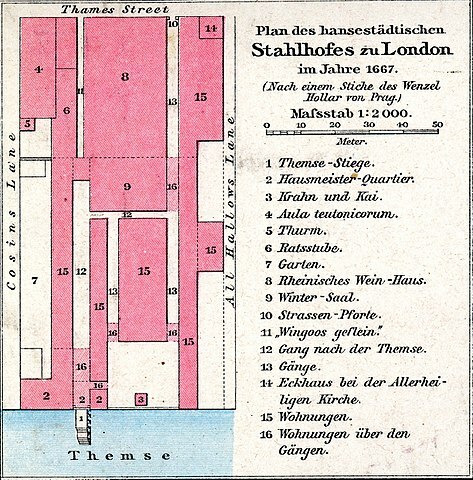 The Stalhof, on the bank of the Thames just west of London Bridge, controlled amongst other things the export of English cloth to much of Europe. It had its own currency, with merchants seconded from the major centres in Lübeck and Hamburg. But not many windows that faced outwards. “Rich German merchants” were targeted by Wat Tyler’s rebellion, and their presence was no more welcomed by the good Städtern of mediæval London. The land under the steelyard was bought by the city in 1853 and turned into Cannon Street station, the site of the aforementioned plaque, and, aptly, right next to what is (I think) the last working wharf on the square mile. By then the great League was no more than a rump, subverted by rise of the Swedes and the Dutch and ultimately sunk by Bismarck. It was finally written out of history in 1862, but the memory persists (if only as a politicised ideal). It is a bit of a shame that none of the Hanse architecture survives in London to rival the gables and conical spires that decorate Lübeck and Hamburg. But there is some historical resonance in a great trading empire parked in the square mile (even if the English once went to war against the free trade it offered) and it played its part in establishing modern London as the entrepôt that it remains today, if more for people than for goods and grain. There are loads of great histories of the Hanseatic League and its role in European history, though they are mostly in German – it isn’t a subject much covered in the English language. A friendly intro was written in 1891 by Helen Zimmern.